Shopping for Toy Story Nightlights? Create an awesome light and sound experience with Buzz Lightyear on your wall! 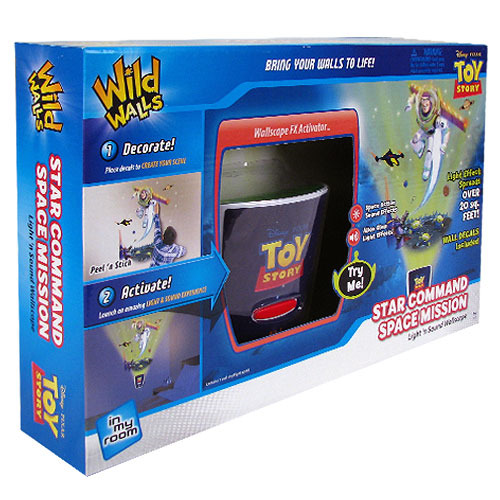 Use the decals included with the Toy Story Star Command Space Mission Night Light with Sound to design a scene that could be straight from the Toy Story movies. Synchronized light and sound effects, including alien glow light effects and space action sound, bring the scene to life with over 20 square feet of light illuminating your walls and ceiling. With different modes and an auto shut-off feature, the Toy Story Star Command Space Mission Night Light with Sound is incredibly functional, too! Ages 5 and up.